There are some parts of our identities that are so important, we can’t imagine not being associated with them. But for people with non-binary gender identities, we often experience this dissociation on a daily basis. As someone who presents as female, I am resigned to people calling me ma’am, miss, and lady. I have accepted that people will assume that I prefer she/her as my pronouns. As I walk around in this world, it hurts that everyone from friends, to families, to strangers will erase a fundamental part of my identity. I don’t expect anyone to magically know or even understand — but I do hope they respect it when I explain. Gender-neutral language may seem like an inconsequential thing, but to those of us outside the gender binary, it’s not. It’s a lifeline. When people refuse to use gender-neutral language — even when I ask them to — I doubt my identity to begin with, and I let others decide it instead of me. If no one else can see it, then maybe it’s all in my head. For a long time, I didn’t identify as trans. In my elementary understanding of gender, I connected “trans” to what I had learned in chemistry class –“opposite.” To me, it reaffirmed the gender binary. But I knew plenty of other people who did identify as trans, some of whom have taken steps to transition to some degree. It wasn’t until I understood that “trans” could mean “other than” that I began to apply it to myself. Even still, with my cis-passing body, I feel like an imposter. The friends who understood trans as a more progressive term were “real” non-binary and trans people. When someone ignores a request for gender-neutral language, it’s telling me that my identity doesn’t exist after all. It’s like using a trans person’s deadname (the name they were given at birth, but no longer use) or misgendering them despite constant corrections. I’ve never met anyone who’s gender variant who thinks others should automatically know — but we do expect others to try when we ask them to. So when someone doesn’t honor that request, it invalidates our identities. No one gets to decide your gender but you. It means that someone in a more privileged position gets to write my narrative. It’s a common phrase that history is written by the victors. History is full of the victors, the privileged, telling the stories. It buries the pain and existence of marginalized communities. And in having my request for gender-neutral language ignored, a cisgender person is erasing my narrative and replacing it with their own. Other people with other invisible identities don’t feel like they can speak up when you ignore this request. One of the reasons I am so adamant about amplifying marginalized voices is that many people who are marginalized can’t. I use my passing privileges by speaking up instead. I let them know that someone is on their side. But when people refuse to use gender-neutral language, or even someone’s correct pronouns, they are flipping off people who might also have non-binary identities but aren’t yet out. And ignoring my request for gender-neutral language says that other identities that may be invisible (invisible illnesses, etc.) should be ignored, too. Someone else’s assumptions negate my experiences, which makes me doubt their validity. I’m a moderator for a Facebook group that explicitly asks its members to be careful of their language. One day, one of the other moderators commented to not use African-American Vernacular English (AAVE) if you’re not Black, and to not use gendered language in a group that doesn’t have only female members. This Facebook community had been widely important to me, because it not only accepted my identity, but encouraged me to express it. It was a place where other people were familiar with intersectionality. In this seemingly safe space, I felt okay asking people to use they/them/their pronouns for me — before I was even really out. This exchange showed me first-hand what Black feminists have been saying all along: white feminism ignores what is inconvenient to them, and radical feminists exclude trans individuals. In this exchange, I thought I was saying, hey, please be considerate of your language! and it felt like she was saying, it’s not a big deal, so how dare you make it one. Maybe to her it wasn’t a big deal, but for me, it was devastating. It was a huge deal that she lashed back out at me. It made me doubt the legitimacy of my request. The aftermath — where she placed herself in the role of the victim — felt like a violation. If you are cisgender, straight, or have another mainstream identity, it’s okay to not be able to relate to the identities that I have; I’m not asking you to do that. And I’m not saying that you should automatically know everyone’s pronouns, nor am I claiming that you go around trying to hurt non-binary people. But imagine that your reality was ignored. Imagine, for example, that you were shamed for being heterosexual. Imagine that your daily reality was offensive to someone else just because you were living it, and so they told you that your reality didn’t matter. What if you were always labeled as queer, and when you mention that you are actually straight, people roll their eyes and tell you to stop overreacting. That, actually, you asking them to be considerate is a huge inconvenience to them. The root of all of this is compassion and respect. It doesn’t mean you need to empathize, agree with, understand, or even like my identity politics. My action — asking for gender-neutral language — doesn’t affect other people. But someone else’s action — ignoring my request for understanding — affects an entire community. These are microaggressions — little ways we tell other people that they don’t matter, and that we don’t respect their view of themselves. We do not all experience life in the same ways, and we should celebrate our very real differences on the basis that we are all human. When corrected, folks may respond that it’s not a big deal: “Sometimes we just forget.” Or they’ll say that I should be happy with what I have: “Look how much progress society has made!” But we need to do better. 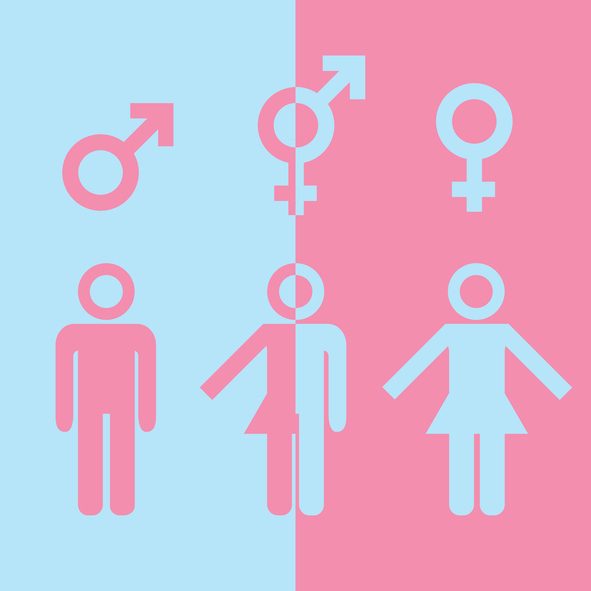 Gender dysphoria and non-binary identities are not unique to the U.S. or even to recent times — there is a history of non-binary genders around the world. Not all of these identities have always been accepted. Given that sexism is alive and well, the only way we can we expect that non-binary identities will have fair consideration is if we start listening to non-binary voices, and an easy first step is using gender-neutral language.